2 out of 3 consumers can’t recall the last time a brand exceeded their expectations, according to Acquia’s global survey of more than 5,000 consumers and 500 marketers. With consumers around the globe abandoning brands that fail to meet their needs, organizations are discovering that positive customer experiences (CX) are not only good for business—they’re vital. 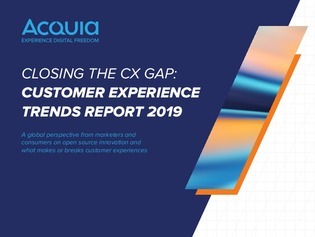 Read ahead to see how you could be closing your CX gap.